There are still three or four big smartphone releases this year, but it's very likely that Oppo's Find X, with its almost bezel-less face, smooth, seamless back that is uninterrupted by camera modules, and elevating forehead (top bezel) will be 2018's most ambitious and radically-designed handset. But had longtime Oppo business partner Dirac Research gotten their way, the Find X would not have won that title -- and it would have pumped out fuller sound. 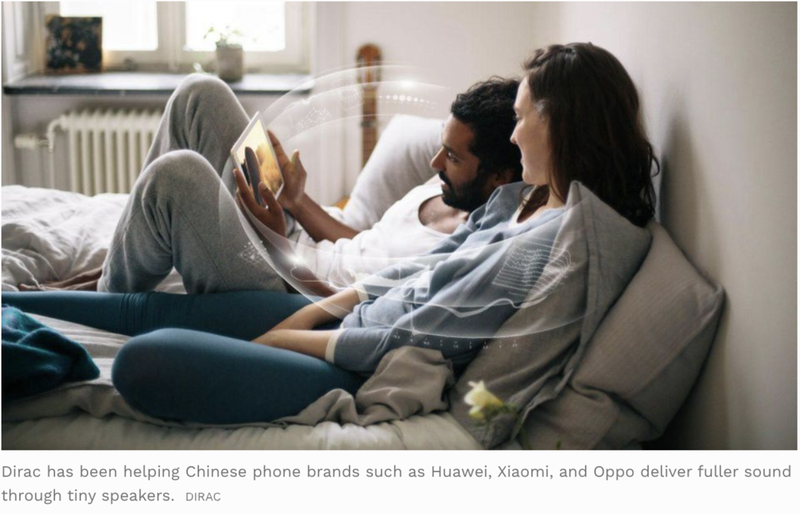 Headquartered in Sweden, Dirac has been working with Oppo since 2012 to design the Chinese phone maker's audio system on a hardware and software level. This task was relatively straightforward back then, when smartphones had sizable forehead and chin bezels to house speakers. All Dirac had to do was apply their expertise in DSP (digital signal processing) to optimize audio quality. But as phone brands increasingly trim bezels, the challenge grew more difficult. And then the Find X decided to eliminate all bezels. "It was almost like we had to work against the laws of physics [to create a speaker set-up for the Find X]," recalls Dirac's CEO Mathias Johansson, who has a Ph.D. in digital signal processing from Uppsala University in Sweden. "We would have loved to put bigger speakers into the Find X, but that went against what Oppo wanted [in terms of a bezel-less phone]. So, we compromised and helped them design custom speakers that fit behind the display in a cramped space." Nilo Casimiro, Dirac cofounder and head of product management, described the Find X's speaker as a "compromise," adding: "we wanted more bass, but bass affects loudness and voice range, and Oppo wanted the emphasis on voice, so we downplayed the bass aspect." Johansson and Casimiro are obviously audiophiles and a perfectionists, because, truth be told, most consumers and reviewers found no issues with the Find X's single bottom-firing speaker. Sure, they didn't pump out sound as full as old HTC phones with stereo front-facing speakers, but did you see the Find X's bezel-less screen? It's admirable that Johansson and Casimiro are that devoted to audio, or else Dirac wouldn't be where it is today. Founded in 2001 by the duo with four other partners, Dirac was one of the early champions of digital music back when audiophiles were still clinging on to analog -- in fact, some still are. The benefits of digital music include the aforementioned DSP manipulation to fine tune audio output depending on the speaker or headphones used. The company got its first big break in 2004 when BMW used its services, and for years Dirac stayed in the luxury automobile and hi-fi audio sectors. But in 2011, Dirac began approaching Chinese phonemakers on helping them improve handset audio quality. "The Chinese market was relatively small at the time, but we foresaw that they would soon become a big player," explains Johansson. "Android and ARM processors were software and hardware that you can buy off the streets and build your own device, and we knew that Chinese brands, with their proximity to vendors and factories, would be able to build handsets at a much more cost-effective manner than the Nokia or Ericsson." Oppo was the first to jump on board and use Dirac's services. Xiaomi followed a year later. Since then, Huawei, OnePlus, Motorola, Alcatel and Smartisan all used Dirac's services at one point or another. Recently, Xiaomi used Dirac HD Sound optimization for its flagship Mi 8 phone, this boosted the audio output of the Mi 8 in not just loud speaker quality but headphone audio. The latter is possible thanks to a "courageous" move by Apple. "Apple removing the headphone jack [back with the iPhone 7, which made it acceptable for other brands to follow suit] really helped us," says Casimiro. "Because it pushed users to go full digital with their music." This allows Dirac to gain more information about the headphone/earphone that the user is wearing and fine-tune audio for that specific set of cans accordingly. Previously, when users used 3.5mm jack analog headphones, Dirac had no way of identifying what the user is wearing. Johansson says working with Oppo and Xiaomi has been a tough, but rewarding experience. "Both [Oppo and Xiaomi] are very demanding partners," jokes Johansson. "But that's what we like about China, they are so forward-thinking and work at a faster pace than any other parts of the world." But if the Oppo Find X's radical form factor required the Dirac crew to "compromise" a bit off their audiophile perfectionist standards, does this mean upcoming smartphones -- which should get more and more thin and bezel-less -- require more audio sacrifices? Casimiro thinks perhaps the trend will reverse itself: "I think for a while, aesthetics of a phone became more important than sound to brands, but I think that will change back. Mobile gaming and mobile video streaming is too important and lucrative of a market for brands to sacrifice audio too much. The pressure is now back on brands to put in better and more speakers." For example, Samsung and Huawei just added a secondary speaker to its flagship phone last year for a fuller stereo sound. If Casimiro and Johansson can have their way, they'd want more. "We'd want four speakers on a phone," Johansson says, half jokingly. "That'd be what we'd like." It might be up to them to convince the Oppos, Xiaomis and Huaweis of the world. Read the original article published by Forbes, here. For more information on Dirac’s mobile solutions, click here. To sign up for the Dirac "Explorations in Sound" newsletter, click here.